Bugs & Flies keep getting into your jacket? Seal of the collar with a Original Buff® as scarf. Your motorcycle jacket’s collar is a little bit too wide. The wind blows through and the odd bug gets in too. Use your Original Buff® to seal of the jacket. -it fills out all the nooks and crannies. -it stays were it is. No matter how fast you go. -it doesn’t need tying. It can’t come loose. -it doesn’t get soggy when sweating. It stays nice and uses the sweat to provide heat relief. The photo was taken on a German summer day around 2004. 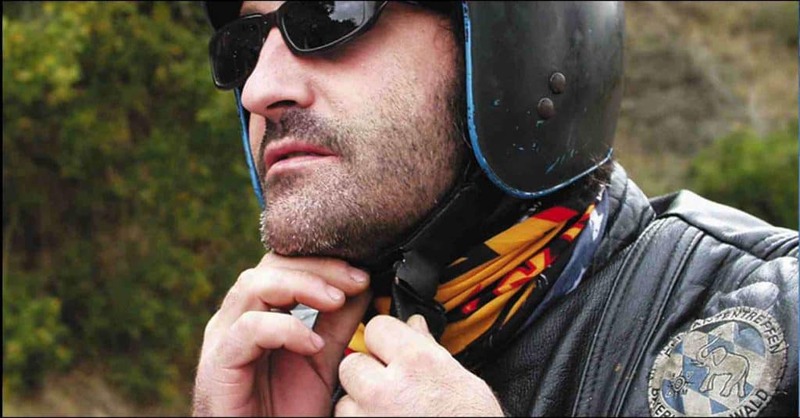 To this day it is the most popular way of using a Buff® in motorcycling. The design pictures is a very old logo design. For all available Original Buff® designs click here.